The Purpetrator is a fly rod version of the plastic worms that baitcastors have used so successfully for Largemouth Bass over the years. The Perpetrator was featured in an article by New Jersey angler and fly tyer Ross Kushner in Fly Tyer Magazine's Autumn 1995 issue. The Purpetrator is built in two parts. 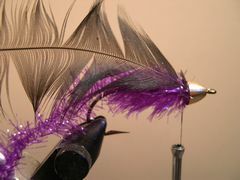 The first part is attaching the marabou tail plume to the Estaz body. The second part is attaching the tail, wrapping the Estaz body, and finishing off the lure with a webby black saddle collar. 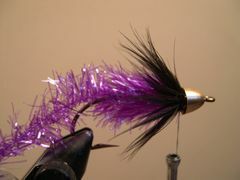 I used some fairly ratty looking Estaz for the fly in the tying sequence that follows because that was what I had at the time. The Estaz that I prefer would have been Rumpf regular Estaz in opalescent purple. 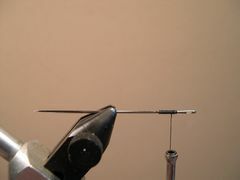 Ross suggests that the fly should be fished with at least a 7-weight rod. He also fishes the Purpetrator on both floating and sink-tip lines. He varies the retrieve of the Purpetrator to find the best presentation on any given day. But, a jerking action that causes the Purpetrator to have a rippling effect with the heavy nose bouncing along the bottom works quite well. Clamp a heavy sewing needle in the vice. Wrap a few turns of thread on the needle and make a whip-finish or a couple of half-hitches, but don't cut the thread. Secure the end of a one-foot long piece of Estaz on top of the thread wraps. 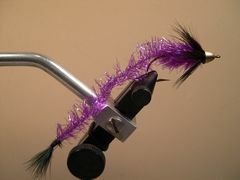 Add a tuft of marabou on top of the Estaz. 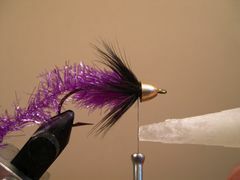 The tips of the marabou point forward, away from the vice. Wet about one and one-half inches of the thread with super glue and take several wraps of the wet thread over the existing thread wraps. Let the glue draw for a moment, then clip and remove the thread. After the glue has dried slip the tail assembly off the needle. You might want to hold the needle with a pair of pliers as you use your fingers to slip the assembly off the needle. Crimp the barbon the hook and slide a cone-head onto the hook shank. 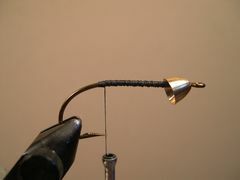 Clamp the hook in the vice and start the thread, then lay down a thick base of thread from the hook's bend back to the cone-head. 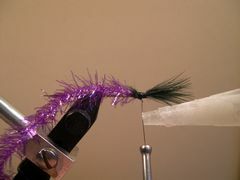 Three inches from the end to which the marabou plume was tied, secure the Estaz to the hook's shank. Wrap the thread back up to the base of the cone-head. 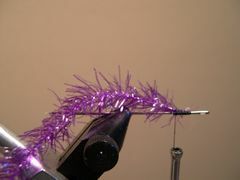 Wrap the Estaz up the hook's shank; stroke the fibers back as you wrap. Make several turns of Estaz behind the cone-head to lock the bead into place. Make several tight turns of thread behind the head to secure the Estaz. Clip the excess Estaz. 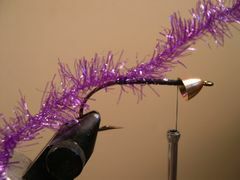 Prepare the hackle and tie it in with the curved side of the feather facing the hook's shank. 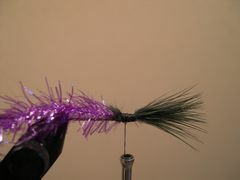 Tie the hackle in by the tip of the feather with several tight wraps of thread. 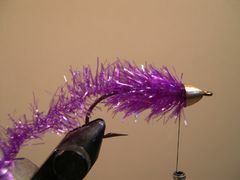 Take several turns of the hackle behind the cone-head bead. Tie off the feather and clip the excess. Wet and inch or so of the thread with super glue. This is the way to prepare a Zap-A-Gap knot. Take several turns of the thread until the wet thread is used up and clip the thread. You have just made a Zap-A-Gap knot. Your Perpetrator is finished and ready to fish.